The main purpose of this documentation is to give the opportunity to contribute for everyone. It is not needed to be logged in at once, to ask anybody for access, you simply send a commit to this repository, and it will be accepted. 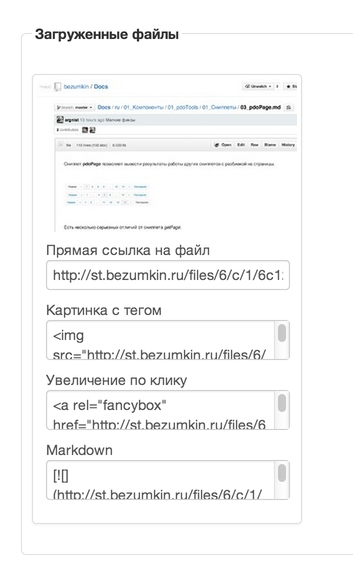 We describe a 3rd party components and the core of MODX in two languages: Russian and English. If you are ready to manage documentation in another language, please contact us by creating issue. All files are written in the Markdown, the names are compatible with daux.io. At any moment you can clone this repository and deploy it on your server. Also you can read files directly on GitHub. To specify the order of the directories and files, we use the numeric prefixes. Between the header and the text from the top and one blank line. Between the header and the text of the bottom blank line not needed. Easier to open the desired page on GitHub and copy the address from the url. The image links can be inserted directly in the text. To specify the image, and use the service on file.modx.pro (requires authorization). It automatically generates thumbnail and markdown code for insertion. System settings need to use bold text, for example: **&parametr** will look like &parametr. Placeholders wrapped in single reverse apostrophes. For example: `[[+placeholder]]` will look like [[+placeholder]]. The code starts from the new line. Blank lines before and after the code voluntarily. For making the forced line break you need to add two spaces at the end of the line. Parser will replace them with the tag br.